After two days of packing, cleaning, and loading the truck, we finally hit the road this morning. Destination: Mounds State Park near Anderson, IN. We choose this spot for its not-too-distant location from Grand Rapids, not wanting to get too confident about our ability to actually not the road at a reasonable hour. We actually left the house just 45 minutes past our loose schedule. Not bad. 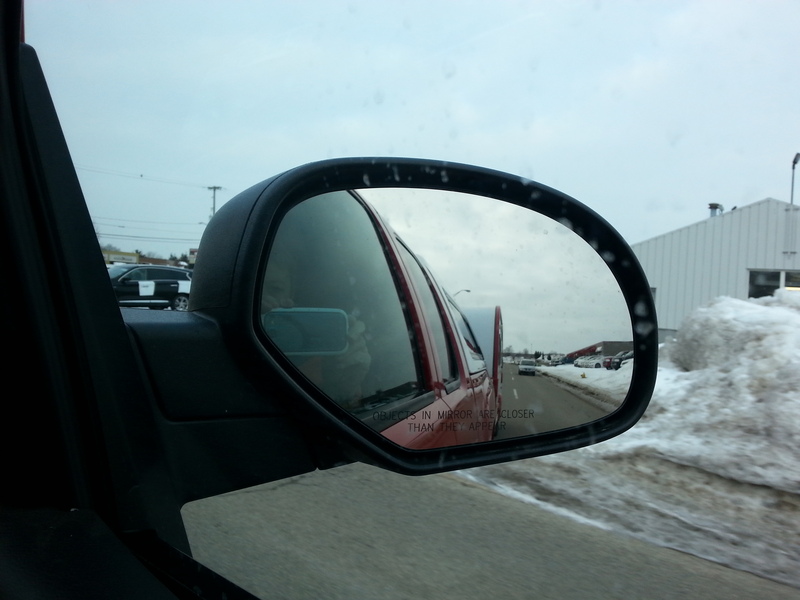 We waved goodbye to the snow. Indiana is F-l-a-t. Relatively uninteresting at this time of year. To make miles speed by, we listened to a David Sedaris audio book Dress Your Family in Courderoy and Denim. He is hilarious and has such a curious voice – imitating his father’s and brother’s Southern accents to such an exaggerated degree that we were totally entertained for the entire drive. So good, in fact, that I’m looking forward to tomorrow’s drive to Nashville. We decided to make a bbq stop in lieu of making dinner in camp. Bird’s BBQ in Anderson fit the bill perfectly (except for not having beer). Delectable baby back ribs, a shared baked potato, and spicy baked beans hit the spot after a long day in the truck. Would like a return trip to try other items but that’s certainly not going to happen for breakfast tomorrow. Took a long hike with Jezzy once we got set up here. Viewed the Circle Mound, which is actually a horseshoe shape, which aligns with the sun on spring and fall solstice days. This mound was apparently completed around 250 AD. Tomorrow, we will investigate the Great Mound before taking off for Tennessee. We’re plugged in to electric power, and have the temp near 50 inside the Fireball. Add hot coffee, a chilled porter, fleece pants, and we’re all snugged in for the night. No water, but that’s OK for a day. Day 1. In the books! One quick note. We spent yesterday at John’s sister’s house. 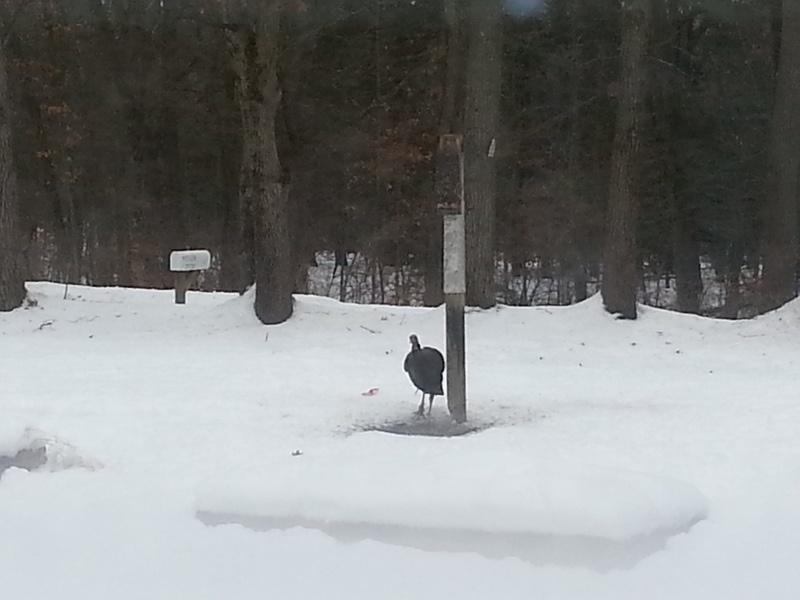 She has a one-legged turkey that has been hanging around her bird feeder for a week or so. He was pretty skinny to start with, but she’s fattened him up quite a bit. Mostly hops on one foot, with a few very painful-looking, one-footed steps in-between. She says he’s markedly better in the last week. This is a pretty poor shot, through a window and a fair distance from the feeder, but you can see how large his right leg is near the foot.. He was feisty enough to give a squirrel that was trying to chase him away from the feeder, the business! Hope this poor guy makes it. He’s lucky to have his Aunt Phyllis looking out for him. This entry was posted in camping, hiking, retirement, simple camping, T@DA, weather and tagged camping, hiking, Indiana, retirement, road trip, simple camping, snow, state parks, T@DA, the great outdoors, weather by Judy Crankshaw. Bookmark the permalink. It’s so hard to be the responsible one…sniff! Ah! Love seeing you make a break from the land of ice and snow! Hope your trip is fantastic, and HAPPY NEW YEAR! Thanks. We didn’t have our best day on the road today (more about that soon), but just plain cold weather beats cold + snow. Wind chill this morning in Anderson, IN was -6. We could heat things up more, but don’t like it too hot in such a small space. Our house is always on the cool side – friends generally bundle up when visiting in the winter. We’ve been known to provide lap blankets on request! Thankful that both of John’s folks are quilters, so we have many! Thank you Aunt Phyllis!!! 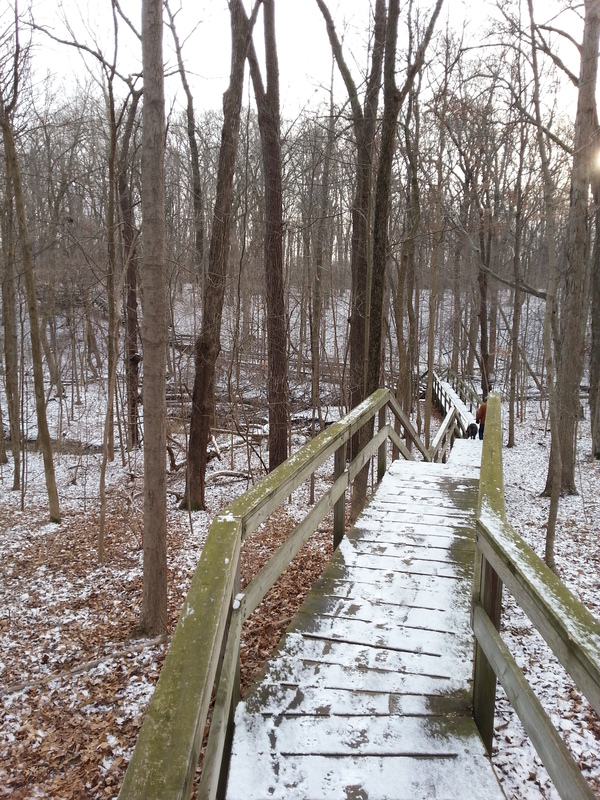 Love the stair step walk….I used to love our winter snow hikes when back home! So refreshing … open the sinus right up! Good times on tap for Nashville…love the city! Yep, if you ever have injured wildlife, you want to have Phyllis take it in. She had a cat for most of last year named Turkey. Guess what date he showed up??? You escaped at just the right time, the forecast is looking grim around here. We actually joked this morning about chasing this big new storm east. We did have to miss one…. I still see snow! Get out of that stuff as soon as you can. Hope you find lots of warmth and sunshine. That shot was on US131 around 68th St. There’s just a dusting on the ground her so we’re headed in the right direction. Still only 20 outside though. Someone had to take care of the turkey. Can’t leave that job to just anyone! You are welcome to come see us if you really want to escape the cold! Plenty of room. We are heading toward the land of gumbo, oysters, and jazz dive bars. Hopefully we’ll find plenty of warmth in the next week. Are you coming to the Blue Ridge Rally in May?